All of these services are performed by highly trained and skilled staff at fair and reasonable prices. Our jobs are supervised by our knowledgeable and experienced foreman who works closely with the business owner to ensure that all work is done to code and in accordance with any pre-engineered specifications. Call (714) 996-3177 today to see how Concrete Restoration Systems can help repair and restore the concrete on your San Bernardino property. We are a fully licensed and insured specialty contractor that has provided high-quality, comprehensive concrete restoration and waterproofing services to residential, commercial, and industrial clients throughout San Bernardino, Ontario, Rancho Cucamonga, Colton, and Chino Hills. Over the years, we've served thousands of satisfied customers and earned a reputation as Southern California's best value for concrete restoration. We offer free on-site consultations and an up-front, written estimate for concrete repair and waterproofing projects in Ontario, Rancho Cucamonga, Colton, and Chino Hills, and nearby cities. When you schedule a consultation, we'll come out to your property to assess the damage, take measurements, and provide a thorough explanation of our recommended solution. Concrete Restoration Systems has decades of experience providing concrete repair services for San Bernardino County residential, commercial, and industrial clients. We're a one-stop-shop for all your concrete repair and waterproofing needs. 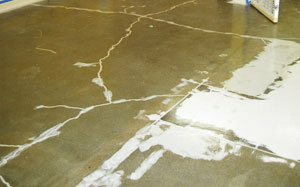 Whether you have decorative or structural concrete damage, we have a solution for you. 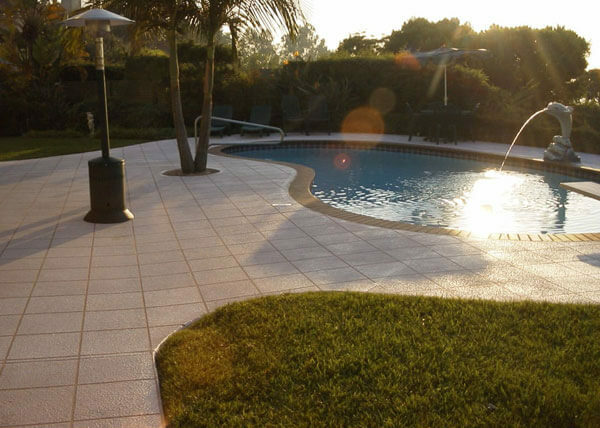 We can repair and restore any concrete surface, including driveways, walkways, patios, decks, garage floors, warehouse floors, basements, interior/exterior walls and facades, and block walls. No job is too big or too small for us, and we stand behind the quality of all our concrete repairs with a written guarantee. Call us today for a free on-site consultation regarding your concrete repair project in Colton, Chino Hills, Ontario, Rancho Cucamonga, or anywhere else in San Bernardino County. At Concrete Restoration Systems, we have over 28 years of experience providing structural concrete damage repair services to residential, commercial, and industrial clients in Ontario, Colton, Chino Hills, Rancho Cucamonga, and other cities throughout San Bernardino County. Structural concrete damage is typically caused by ground settling, earthquakes, severe weather, construction defects, or decades of wear and tear. When you hire Concrete Restoration Systems, you can trust that you'll receive an honest assessment of the extent of your concrete damage and be provided with a recommendation that will give lasting and reliable results. We apply the industry's best practices for structural concrete repairs and use high-quality products. When repairing structural concrete damage, we clean or replace any damaged or corroding rebar, prep the concrete surface, and inject epoxy to fill cracks and gaps. We recommend epoxy for most structural concrete repairs because it acts to weld the cracks together, and once hardened is stronger than the original concrete. After our repairs are complete, we can then apply a high-quality waterproofing system to protect your building from future water damage. Since 1990, we've provided thousands of satisfied clients with competitively-priced, professional concrete restoration services. As a result of this extensive experience, we have the skill and knowledge to provide all types of concrete restoration services throughout San Bernardino County, including historical building restoration, concrete floor restoration, concrete patio restoration, and more. We provide a free on-site consultation for concrete restoration project in Ontario, Rancho Cucamonga, Colton, Chino, Chino Hills, and nearby cities, no matter how big or small the job. When we arrive on-site we'll assess the extent of your concrete damage, take measurements of the affected area, and discuss our recommended solution. Our comprehensive concrete restoration service can include repairing deteriorated rebar, filling cracks with high-pressure epoxy injections, and sealing the surface before applying a waterproofing system. 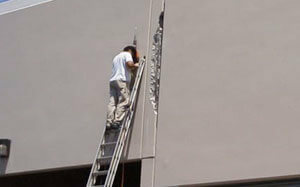 These services are highly effective in strengthening deteriorating concrete and restoring its original visual appeal. Call us today to discuss your concrete restoration needs. 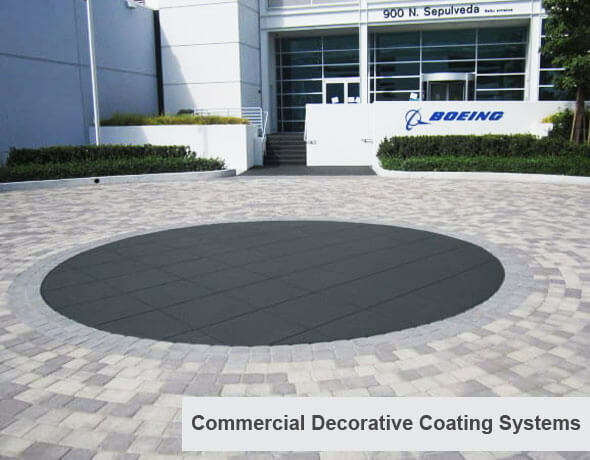 Whether you're looking for a simple epoxy coating for your warehouse floor, or you want to create a sophisticated look for the exterior entryway of your commercial building, Concrete Restoration Systems has the skill and expertise to deliver just what you're looking for. 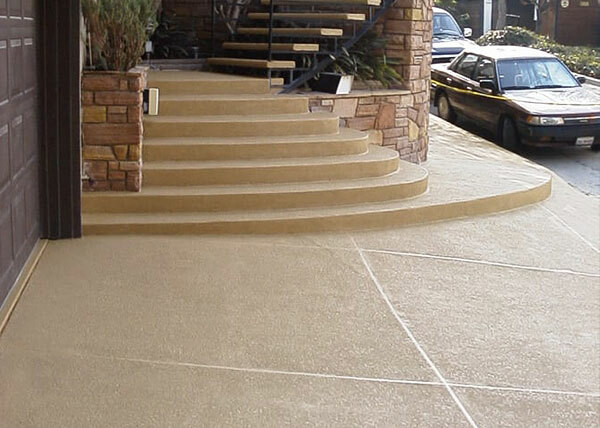 Over the last 28 years, we've applied a wide variety of high-quality decorative concrete coatings on driveways, sidewalks, patios, pool decks, garage floors, and other concrete surfaces throughout the San Bernardino area. 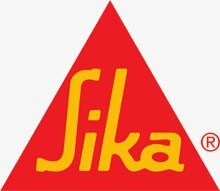 We are approved applicators for Sika, SealBoss, WestCoat, and Master Builders Solutions by BASF, and receive ongoing training on their latest systems and application procedures. By using the industry's best products and techniques, we're able to provide our clients with beautiful, long-lasting results. 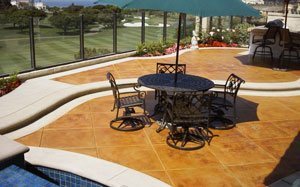 Our decorative concrete coatings are available in a broad range of colors and faux finishes including stone, tile, brick, and abstract patterns. We take the time to listen to each client's preferences and concerns to make sure that we're delivering a concrete coating that complements the look of your home or business and meets any specific functional need. 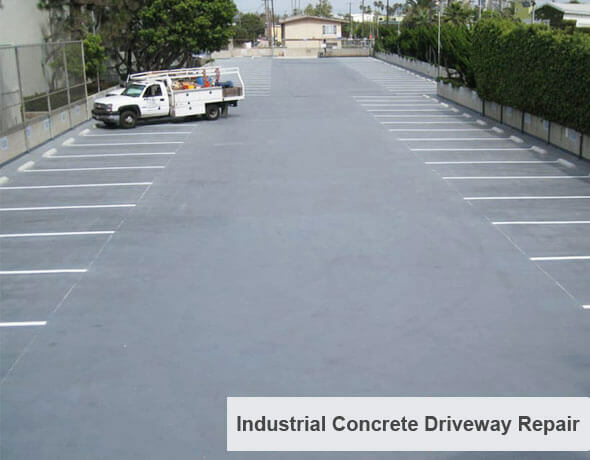 Call today to speak with one of our concrete specialists about our decorative concrete coatings available in San Bernardino, Ontario, Rancho Cucamonga, Colton, Chino, Chino Hills, and nearby cities. Concrete Restoration Systems specializes in the repair, restoration, and protection of wood and concrete surfaces and buildings. Applying a waterproofing system helps protect your building from costly repairs due to water damage. Our waterproofing services are ideal for concrete and wood decks, basements, floors, walls, patios, railings, support beams, and more. Before applying a waterproofing system, we'll identify any existing damage and provide any necessary repairs. 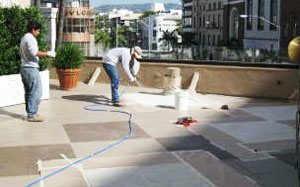 We use high-quality waterproofing systems made by reputable manufacturers, and undergo continuous training to stay up to date on the latest application techniques. Professionally installed waterproofing systems last between 5 and 10 years providing your home or business with lasting protection from water infiltration, which can cause rotting and warping in wood and cracking, sinking, and deterioration in concrete. 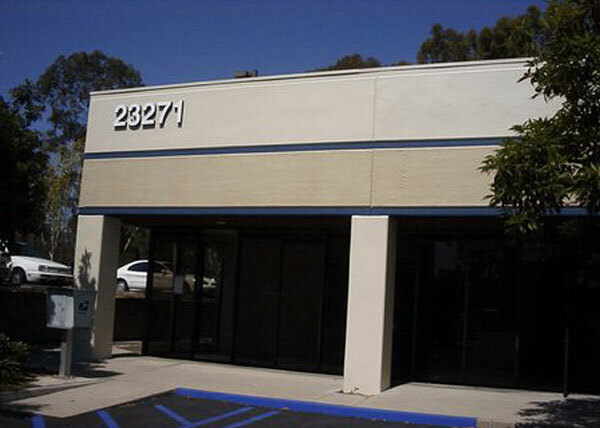 We provide competitively-priced waterproofing services to Rancho Cucamonga, Colton, Chino, Chino Hills, San Bernardino, and Ontario home and business owners. Call today for a free consultation.